The most famous figure in cricket is back. Another in the excellent collection of Wisden books celebrates the champion cricketer's achievements on the 100th anniversary of his death and is, like all Wisden/Bloomsbury books, beautifully produced. W.G, The Doctor can, according to acclaimed author and Wisden stalwart, Jonathan Rice, claim to be what the Wisden Almanack needed. Indeed, Grace made his debut as a sixteen-year-old in 1864, the first year of the legendary Almanack. Whilst there were other annuals bringing the cricket world in writing to the public, W.G's extraordinary exploits coupled with Wisden'?s printing of scorecards, helped set the Almanack on its way and which gives the same pleasure to its global network of readers over 150 years later. That said, Rice comments that inferior players often received more of a mention for an elegant innings than Grace did for his far more colossal scores. Admittedly, in the days before reports, only scorecards were printed so who knows? Maybe the great man's reputation was already known. What makes the book and its contents from its collections of articles through Grace's playing period fascinating are the marked changes in the times. As an example, who would have thought that fewer matches were played at Lord? 's because of the grouse season? Great use is made of scorecards in which Grace contributed mightily - sifting through cannot have been easy - throughout his lengthy playing career and there are many other pages with a summary of the match scores and reports making this an excellent resume of W.G's career. Naturally, on his death, Wisden's obituary is printed in full with an interesting footnote that there followed - not in this book due presumably to page restraints - thirty-four pages of statistics. Some are included after the obituary. The book is far from finished after The Doctor's death in 1915. His memory lives on and his name continues in Wisden articles and many are quoted up to and including the 2013 Almanack. Obituaries of other members of the Grace family appear and the book ends with a chapter on W.G's extraordinary career figures - almost 55,000 runs and 2,900 wickets. 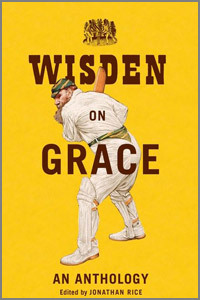 Needless to say, Wisden on Grace is another beautifully-produced Wisden/Bloomsbury book and Jonathan Rice is to be complimented on bringing W.G.Grace's formidable feats and life story to our book shelves.